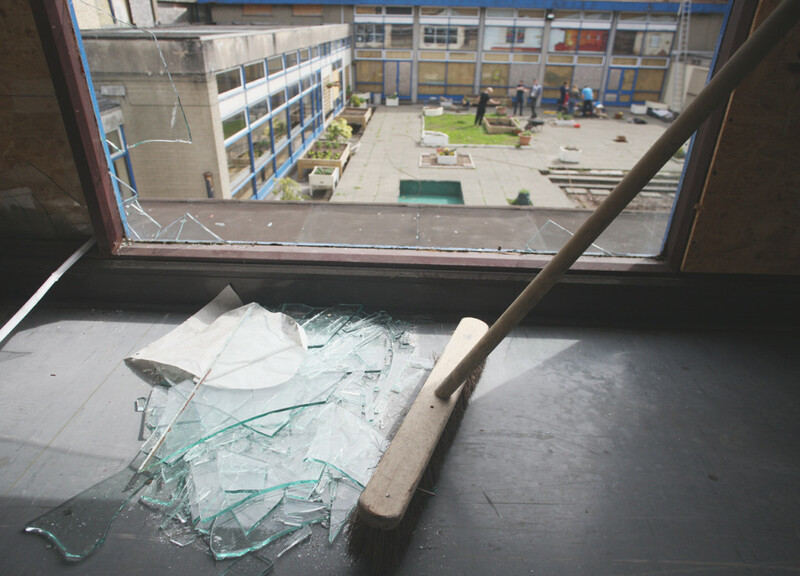 VANDALISM to the old St Gemma’s School has resurfaced after a number of windows were smashed. Local youths were spotted on rooftops and inside the derelict building at around 8pm last Monday evening with significant damage caused to windows and the front door. The site on Ardilea Street has been plagued with vandalism ever since it closed in 2013, with thousands of pounds worth of damage caused. Work is well underway in the courtyard to transform the site into a community garden for growing and learning, which is being carried out by Ardoyne Bone Community Trust, Ardoyne Youth Enterprises and AYE Outreach Team. Kevin McGarry, Building Manager at the site, said the latest vandalism was a ‘real shame’. “This is just the latest incident in recent months with more windows smashed and further damage to the rooftops,” he told the North Belfast News. “It’s a real shame to see. We need to find out the kids who are doing this and ask them what their problem is. Maybe they are bored but this will be a place for all of the local community when completed. “I would also appeal to parents to find out where their kids are in the evenings and what exactly they are up to. “We are in the process of trying to get this space up and running again. This place was closed and abandoned for two years and desperately needed restored to something positive. “We have already installed some community allotments to get people involved and it is also a place for people to meet. Local SDLP Councillor Paul McCusker expressed his anger at the latest act of vandalism. “I was annoyed and saddened to hear there was more damage caused to St Gemma’s site. There has been significant work done by the ABC Trust and the current users of the building, Robbie at the gym and Sean from the YEHA Project to ensure the building continues to provide an important service to the community. “I would urge parents and local people to report anything they see and encourage those youths involved to stop damaging local facilities.